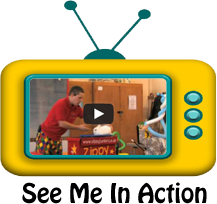 Zippy Junior is one of the best and most popular children’s entertainers in Heswall. Zippy Junior’s shows are packed full of fun, laughter, comedy, magic and his packages ensure that the children and fully entertained from start to finish. The most popular show is the 2hr stress free party package. With this show, Zippy Junior will organise the whole party for you, including magic, balloons, disco, party games and prizes. All that you have to do is feed the children! Whether the show is to be in your home, hotel suite, church hall or community centre, Zippy Junior will ensure a show not to be forgotten. Zippy Junior is a family entertainer, and has been entertaining for over 12 years, even though he is just in his mid twenties! Zippy Junior aims to be the best entertainer in the North-West, and he is a great asset to any birthday party, christening, wedding or other function. Zippy Junior has many different packages to choose from, including magic, balloons, circus workshops, mini disco’s, karaoke and face painting.